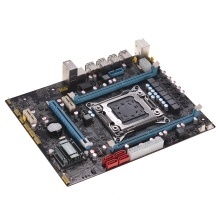 Support for Intel 6series or 7series chipset and for LGA2011 processor, delivers great performance enchantment to system and ultimate scalability hardware expending. Support 1*PCI e*16,2*PCI e*1, delivering a large leap forward in reducing latency and accelerating systems for workloads demanding large capacity and quick storage. Offer DMI2.0 slots, support DDR3 DIMMs channel memory, and support up to 8GB large memory capacity. Please don&apos;t mind if the motherboard model or appearance is adjusted, as the product is constantly being optimized and updated.